Here’s to soft pinks, softer pillows and the sweetest dreams :). 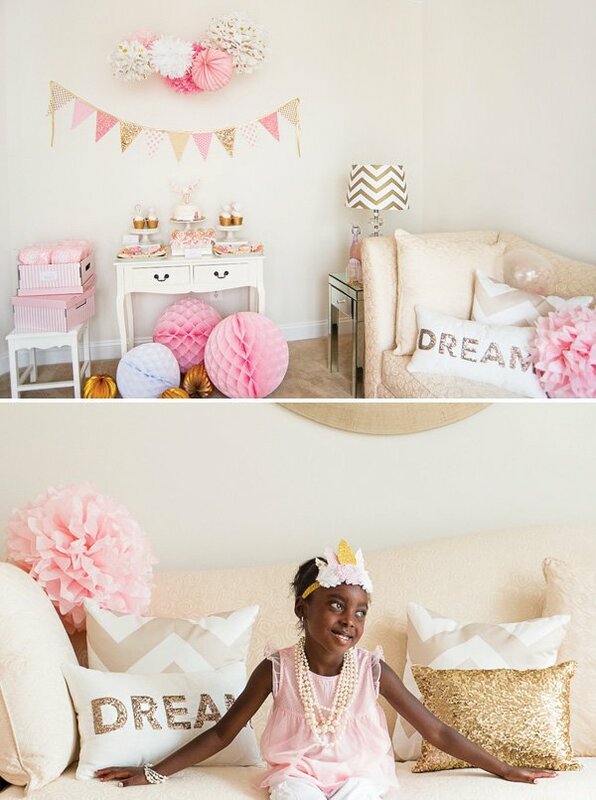 Pamela Dawkins of Pamela Simone Events dreamt up this Dreamy Pink & Gold Glam Pajama Birthday Party for her precious daughter Cailey’s 7th birthday. I love the idea of having an “almost sleepover” for younger girls — all of the fun of a slumber party for girls in that in-between stage. 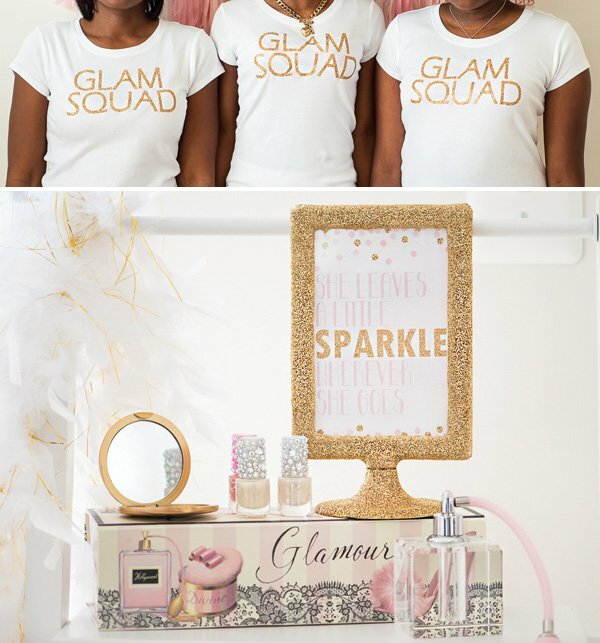 Mom and Cailey’s older sisters generously served as the ‘Glam Squad,’ passing down their tried and true beauty secrets to all of the little beauty queens — such a sweet way to celebrate your little girly girl! My daughter Cailey is a girly girl. She likes purses, nail polish, dancing to her favorite music and wearing anything that sparkles. 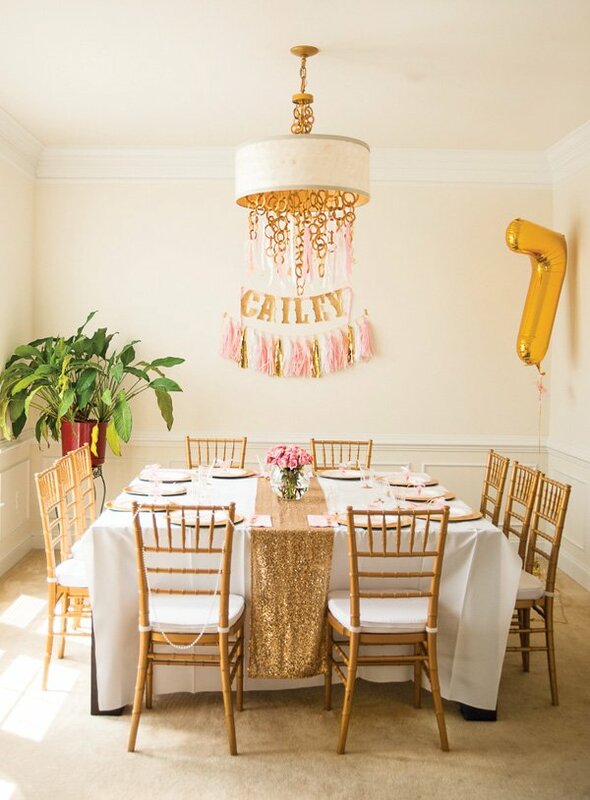 Since she was turning seven, we decided on an “almost sleepover” we themed a Glam Pajama Birthday Party, incorporating a glamorous color palette of pink and gold. The girls were invited to wear their pajamas and not to forget their pillows! The girls had fun playing telephone, decorating pillow cases and using their microphones to sing their favorite songs. The “Glam Squad” (which consisted of me and my older daughters) were at the girls’ service. We painted their nails, applied eye shadow, added colorful hair extensions and topped it all off with sassy pink feather boas and strings of faux pearls. The evening was capped off with a silly string fight in the back yard. 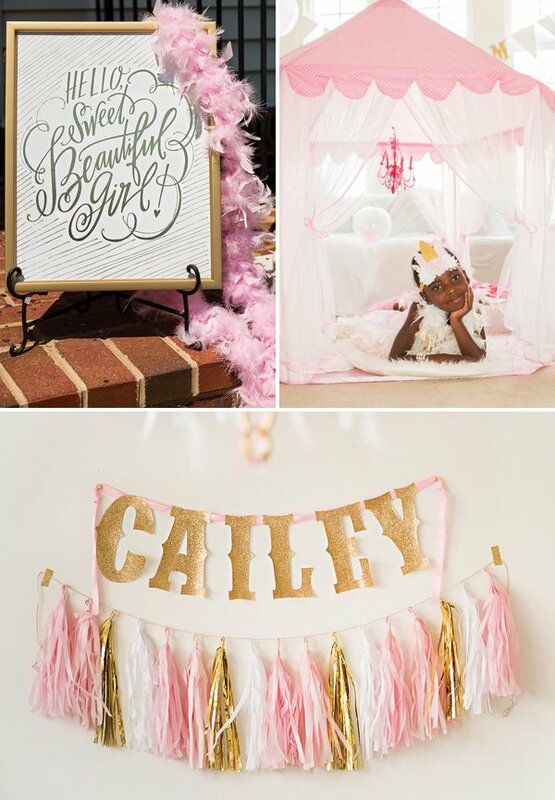 The “Hello Sweet Beautiful Girl” welcome sign greeted the girls at the door adorned with a pink feather boa. 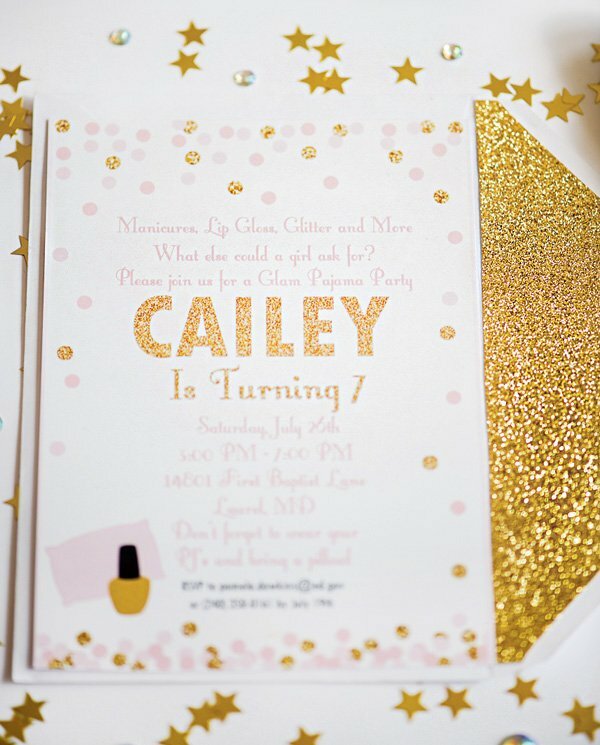 Super-sparkly gold glitter was added to the foot of each drinking cup, utensils and picture frame for extra pizzazz. Pink and white lace ribbon was added to the chandelier to accentuate the fancy, glamorous atmosphere that I wanted to create. 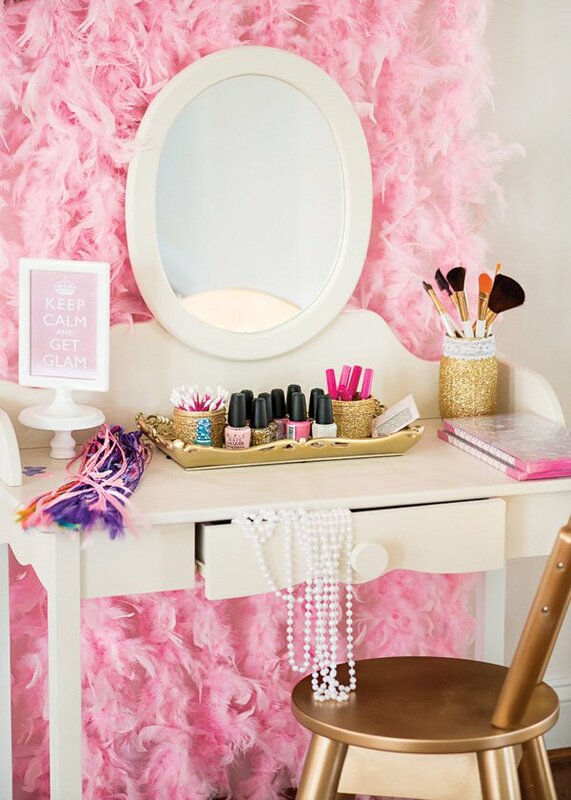 Gold spray paint was applied to Cailey’s white vanity chair and a pink feather boa backdrop was hung behind the vanity for the glam factor. 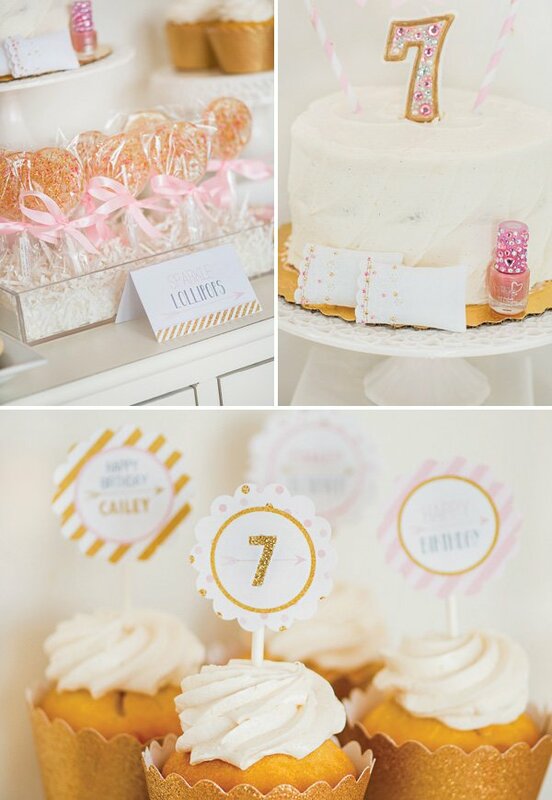 The dessert table featured adorably decorated cookies in the shapes of nail polish, perfume bottles and pajamas , cotton candy “pillows,” lovely glittered lollipops and a white cake accented with miniature doll pillows and nail polish to mimic the invitation. 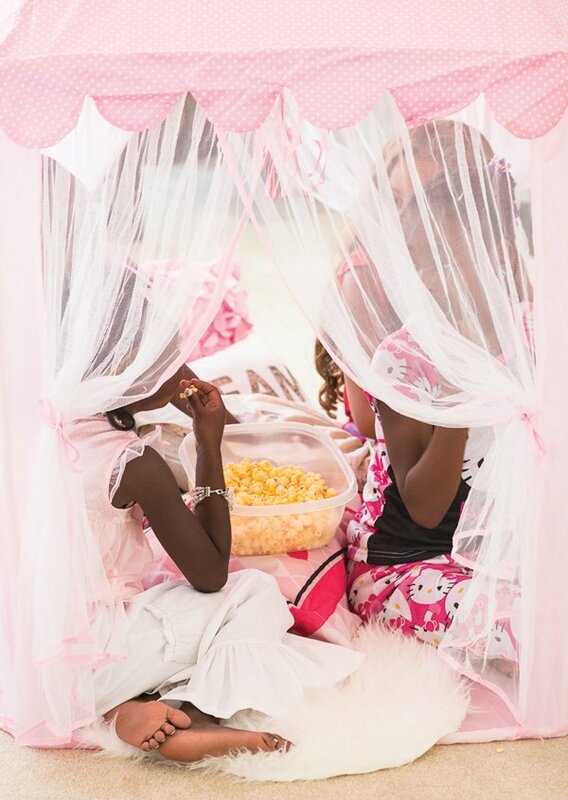 In our lounge area, the “princess pavilion” tent was the perfect place for the girls to relax and munch on popcorn. I loved all the little touches. 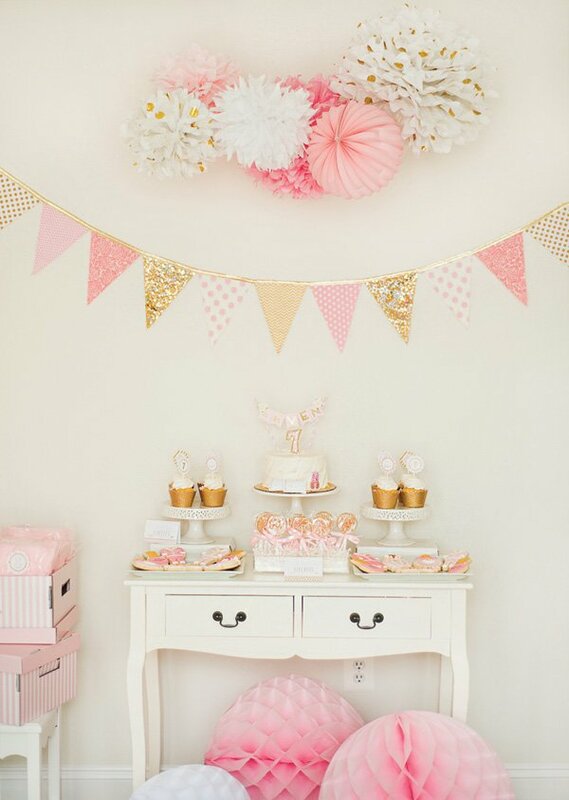 But my favorite detail was the pink and gold sequin fabric banner, it was the perfect inspiration for our glam pajama party and very pretty as the dessert table back drop. 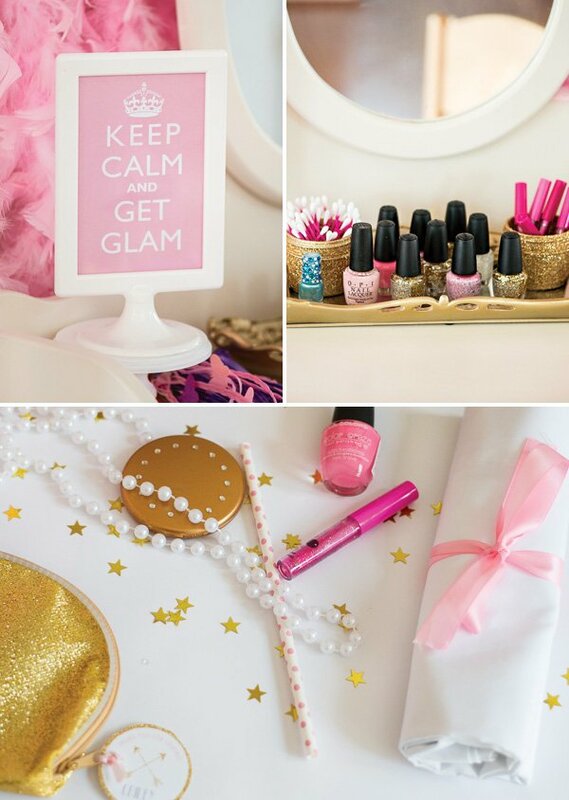 Party favors included a gold glitter cosmetic bag, a gold and faux diamond compact, lip gloss and nail polish. 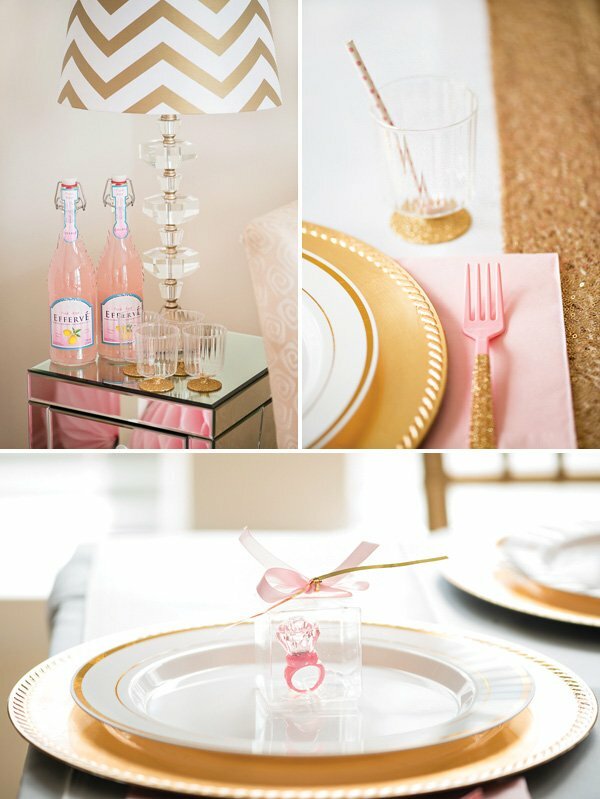 Each guest was greeted at the dining table by a clear favor box containing a pink ring that lit up when turned on that resulted in lots of “oohs” and “ahhs” from the girls. The white and gold sequin “Dream” pillows were from Tuesday Morning. They were on the shelf sideways and I had no idea what I was going to see when I reached for them! To my surprise they were only $9.00 and so it was confirmed the Glam Pajama Party was meant to be! Just lovely!!! 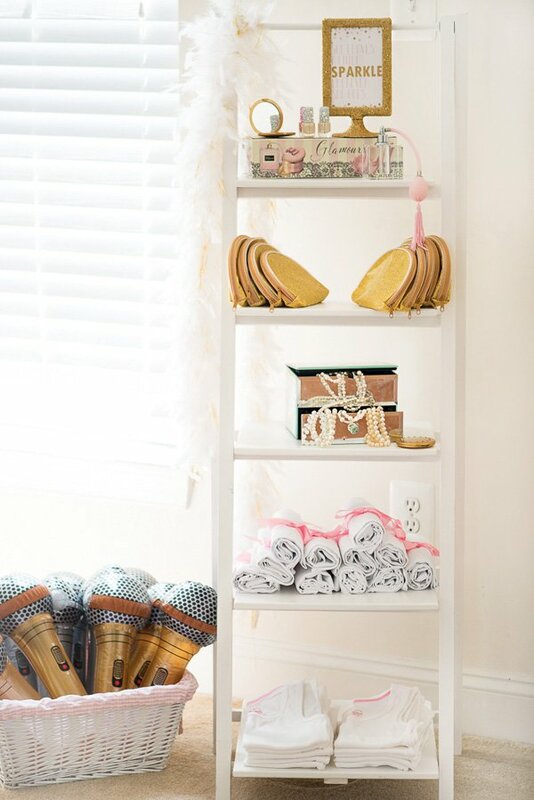 I’m so impressed with the fabulous color scheme, the attention to detail and all the little things that make it so perfectly girly. Great party! where can i get the pink tent? Wow. Outstanding. The best party I've ever seen. Shoot, I want to put it on my page. I'm about to look at it all over again. Yes Pam, you did that. By the way, Cailey is beautiful. This is ABSOLUTELY divine! I am in awe! What a gorgeous set up! The styling is just amazing! Gorgeous! Love the design and it’s simplicity. I always love sparkle! Beautiful party!! Where is the vanity from?